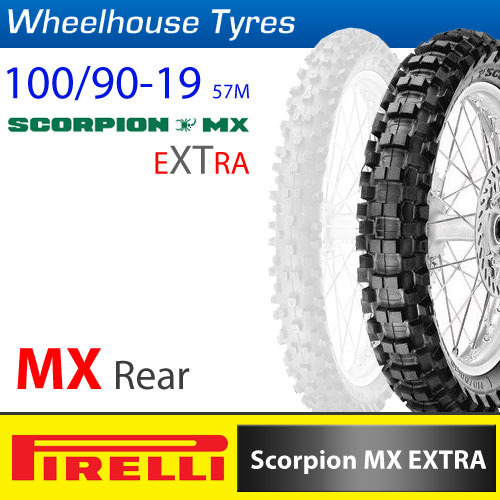 The Pirelli Scorpion MX Extra MX Tyre is able to offer something for every rider.. 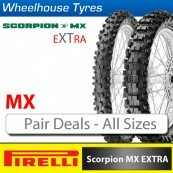 It is the choice of the regular amateur to Semi-Pro racers who ride all typres of terrain and demand performance lap after lap. FRONT KNOBS: arrow-like layout and side knobs for directional accuracy and straightaway visibility; V-shaped knobs improve braking stability and cornering side hold. REAR KNOBS: maximum traction on all terrain applications. Surface area and compound’s carbon black structure for balance between stiffness, reliability and lasting performance. Perfect application for training; optimal compromise between performance and durability. Training performance in all terrain conditions with uniform knob wear, resistance to deformation while damping and thus an extended durability.